The crystals of thorite (sulfate of thorium) are very alike on Zircon (which also often is radio-active), have a prismatic type and amorphous structure. Colouring changes from almost black to brown and yellow (at orangite - to the almost transparent crystalline variety of thorite is the most dangerous imitator of jewels). Black, reddish-brown, yellow-brown, orange (orangite). Unchanged uranium-Thorite is transparent, olive-green to green - very dangerous; Farrithorite brown, darkly-brown, black, wax-red and red. Quite often painted unevenly. Is a yellow, brownish, or black radioactive mineral consisting of tetragonal thorium silicate. It occurs in coarse granite and is a source of thorium. Composition varies in wide limits, maintenance of ThO2 hesitates from 45 to 75%. Most ordinary admixture of U (from stakes to 10% and more UO2), the admixtures of Fe, Ca, P, Al, Ti, are ordinary also. Table of contents of Fe, Sa and Р can arrive at a few percents accordingly in Farrithorite, calciothorite, auerolite (phosphotorite). Differentiating of varieties on chemical composition is not clear. Grainy, crystals and their aggregates (from microscopically shallow to a few sm is in length), by part of collomorphic and even gel-like (reminding gel - these destructions of crystalline lattice of thorite are caused the high level of radiation radiation) excretions of this mineral. Thorite melt fuse in flame of candle, dissolves in muriatic acid and very radio-active. After treatment of grains of thorite during 4-5 hour hot concentrated HC1 he loses Fe and Th (to 80%); there is fragile frail brittle white unmagnetic skeleton of silica. In the vacuum-sealed tube many Thorite select water; on coal not melt fuse, the edges of grains melt flow fuse only; black Thorite at burning becomes inconspicuous-brown-red and gives a yellow-brown slag, orangite is done mat-brown, after cooling again acquires the orange colouring. Easily decomposes muriatic acid with the selection of gelated silica; after burning decomposes hardly. Gives characteristic reactions with plavnis on U and Fe. Not analysed in ordinary laboratories and on productions. Typical mineral of some pegmatites, presenting a large danger for unenlightened - it radio-active mineral, especially in an association with the most dangerous uranium and Uraninite - by the typical mineral of pegmatites - base raw material of nuclear industry of industry (including military). The beautiful crystals of pegmatitic vein, lode, mines, found without application of dosimetric equipment, can present a substantial health hazard and life of incompetent mineralogist-"truth-seeker". Pegmatites are a place of base accumulation of various radio-active minerals, imitating jewels, therefore the visit of pegmatites without dosimeters and skilled explorers-specialists is categorically forbidden. 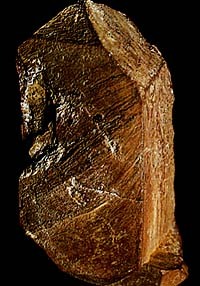 Not too widespread in nature, Thorite be found in syenitic pegmatites of Brevike and Arendale in Norway and on Madagascar, together with zircon, biotite and amphiboles. In an association with the sulfides of Thorite Limi-Pass is met on a vein, lode, mine (hydrothermal) mine deposit in the state of Idaho and in the mountains of Bitterut in the state Montana (USA).